Several highly venomous sea snakes were spotted last week on a beach near Oxnard in Ventura County. 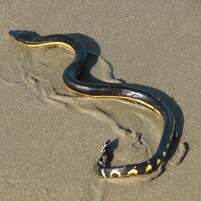 On Thursday, a dead yellow-bellied sea snake was spotted on Silver Strand State Beach. On Friday, a surfer discovered a lethargic sea snake on the same beach. Sea snakes typically spend their entire lives in the water and only come to shore if they are injured or ill.
Scientists report this is the farthest north the sea snake has ever been documented in the Pacific Coast of North America. Normally, the venomous snakes are found in tropical waters closer to Baja California and Central America. However, this year’s El Nino is warming the ocean and attracting more tropical species such as hammerhead sharks, turtles and tropical fish to the Central Coast. Interesting, other accounts elsewhere said these snakes have come to this area some 30 years ago also. There was only one sighted according to some other reports, it was found on the beach, captured, and died some 30 minutes later. Either way, not something Id like crawling into my wetsuit. Snake swarms…….surely a sign of Apocalypse. I think we need Mr. Slanders’ unique perspective on this.